Fish sauce is an ingredient that people either love or hate. The smell is a bit overpowering but the flavour, in tempered amounts, might just be the very thing that would wake up the flavour of any savoury dish. If you have yet to be converted, do read on. 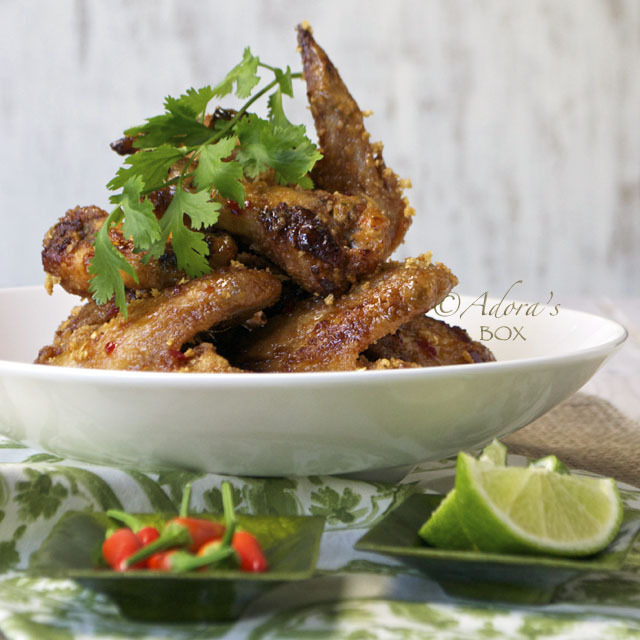 The ubiquitous fish sauce is the tasty agent that sets these wings apart. Recipes that greatly vary from each other are popping up in a lot of food sites and I was just intrigued. 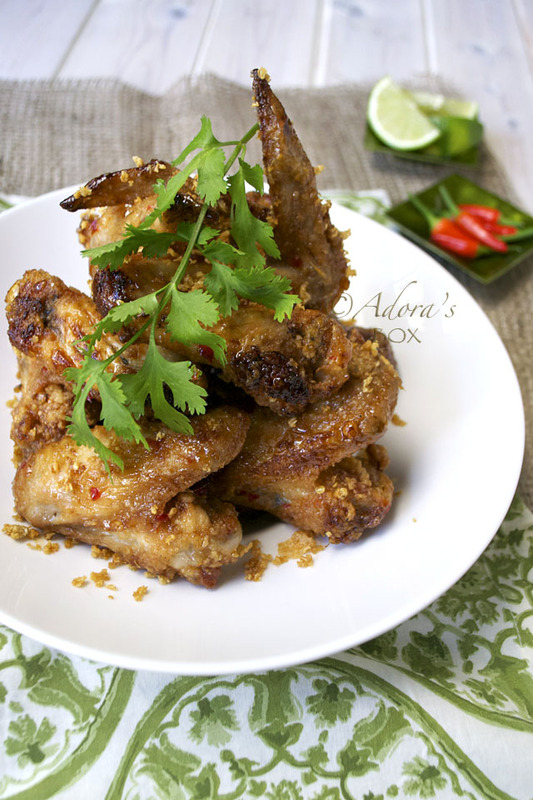 After reading the recipe for Ike's Vietnamese fish sauce chicken wings (popularized by the Pok Pok Restaurant in Portland, Oregon), I just had to make it. The original recipe stems from the hawker stalls in streets Saigon. There is nothing unusual about the recipe. It is in fact the usual seasonings used for chicken in the East. It is the fish sauce in the seasoning that is probably what attracts the Western palate to it. On its own, fish sauce is quite pungent but when used as a seasoning, it gives fragrance as well as an umami boost. 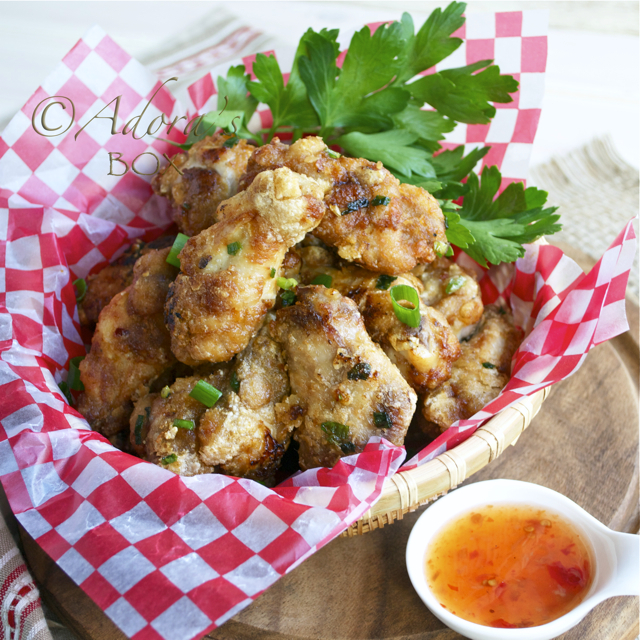 My version of fish sauce chicken wings is very simple but is intensely tasty. Chicken wings are usually chopped into dainty drummettes and the wing tips discarded in the West but I have opted to keep it whole as we usually do in the East. I added lime juice to the glaze to balance the sweetness and saltiness. 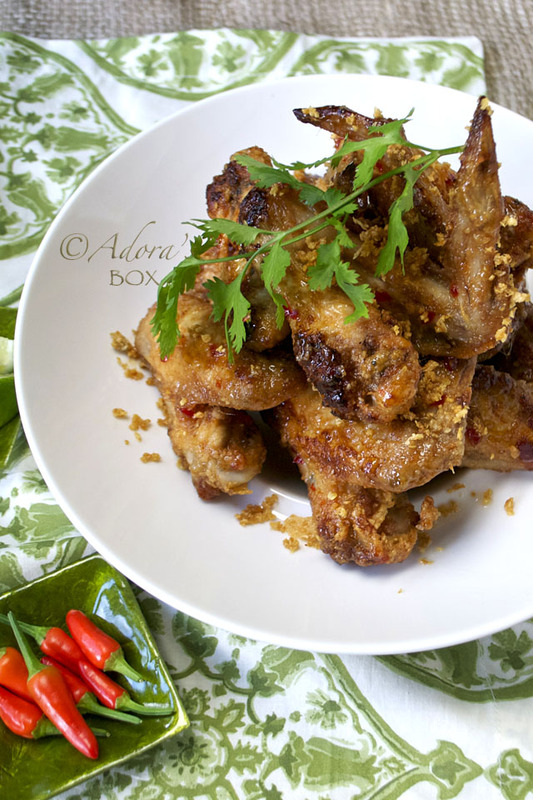 It is that small difference that sets these fried chicken wings apart from the rest. The crowning glory, of course is the fried garlic topping. 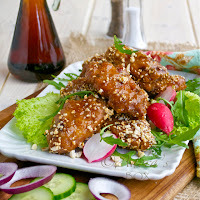 Altogether, the crisp texture of the wings and the sticky, spicy glaze makes these wings quite addictive. Mix the garlic, chilli, lime juice, fish and light soy sauce and the sesame oil. Use to marinade the wings. Set aside for at least 10 minutes. Add the egg white to the chicken and mix very well. Dredge each piece in the corn flour then shake off the excess. Heat up the cooking oil. When very hot, fry the chicken wings on medium heat, a few pieces at a time until golden brown and crispy (10-15 minutes). In a clean wok, fry 1 tbsp. of the garlic in 3 tbsps. of oil (you can use the oil used for frying the chicken) on low heat until golden brown and crisp. Quickly skim off with a slotted spoon onto a paper lined plate and set aside. Pour off the oil and in the same wok, mix the remaining 1 tsp. of garlic with the rest of the ingredients. Bring to a rolling boil on high heat. Add the fried chicken wings all at once and stir quickly to coat. Keep stirring until the glaze is all absorbed and caramelized. Transfer to a serving dish and sprinkle with the fried garlic. Previously I do hate fish sauce because it seem like funny taste but after I started cooking which ingredients called for fish sauce, I just give it a go and try. And at last, I came to love using fish sauce now (can't remember what dish is that, that makes me love fish sauce from now on). This chicken wing of yours makes me would like to go for another piece and another piece! Must be flavourful and tasty. If I wanted to bake the chicken wings instead of frying, what should I set the oven temperature to? How long should I cook the chicken wings? I must say that this is one of those recipes that taste best fried although you can bake them if you want to. Drizzle with oil after dredging in corn flour and bake in a preheated oven (350° F/ 180° C) for 40 minutes turning at half time. Glaze as above. I always have a bottle of fish sauce in the fridge, but I only have one recipe that I use it with, until now. 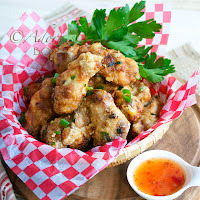 The pictures of these chicken wings have me craving these. 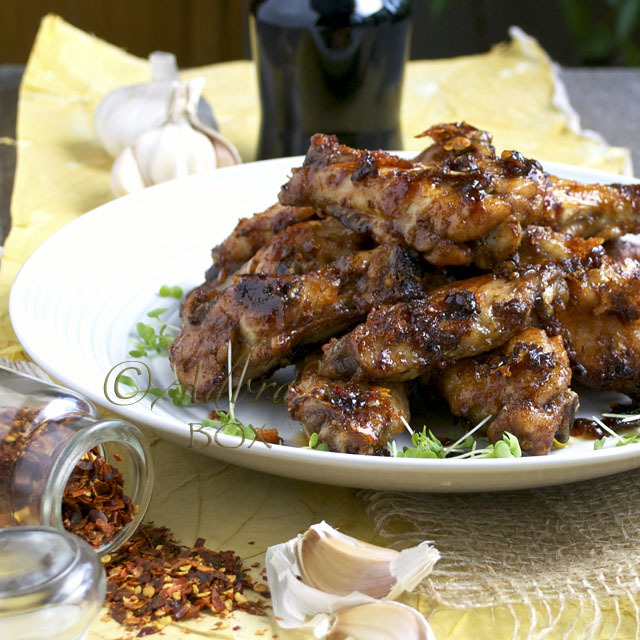 The marinade alone sounds like it would yield delicious wings but then the sauce - OH MY! Love this! I actually have tried a lot of your chicken dish, Adora and I have to say you are so expert creating flavors. This is another great recipe that I must give it a try! Fish sauce is one of my favorite condiments! I think Think this is delicious.